Paris, the French Capital or better knows as the "City of Light," is one of the international MICE capitals, drawing millions of tourists from around the world every year. Stroll around the cafés, bistrots and fine dining restaurants and get enchanted by the historic, modern, romantic and elegant sites Paris has to offer (we probably could add hundreds of adjectives to describe Paris). Nearly every corner of the city will bring you to charming and exquisite avenues and neighbourhoods: Champs-Elysees, Montmartre, Montparnasse, Bastille. So for this week’s blog, we will take you to the heart of Paris, on a journey through four different neighbourhoods or Paris’ arrondissements with each of them offering a wonderful meeting venue. Our first hotel, The Peninsula Paris, is situated in the Trocadero or Paris’ 16th arrondissement. This neighbourhood has to be one of the most overlooked areas in the city - partly because it is tucked away in the west corner of town and over time it has become synonymous with chic. Even though the area is slightly hidden, you will find fascinating museums, cool cafés and lots of shopping opportunities. The hotel, just steps from the Arc de Triomphe, sits in the heart of Paris within walking distance of some of the world’s most famous monuments, museums and luxury shopping districts. Combining classic Parisian chic and world-class hospitality, The Peninsula Paris is a coveted location for memorable events in the French capital. The hotel’s portfolio of meeting and reception venues ranges from small boardrooms and private dining suites to a traditional Parisian salon connecting to the majestic Pérouse Gallery. In need of a bigger space? The Etoile Ballroom can host up to 200 people with state-of-the-art technology. 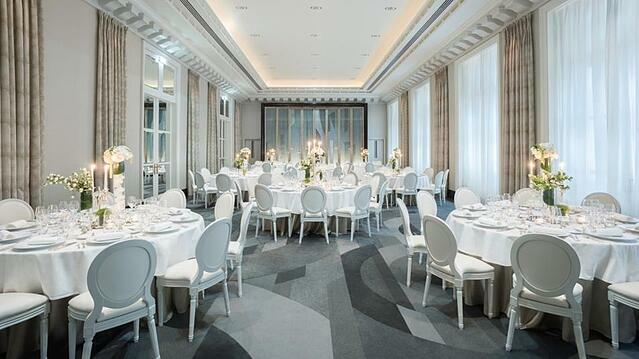 Book your meeting rooms at The Peninsula Paris with MeetingPackage.com. For our next meeting venue, the Millennium Hotel Paris Opera, we will take you to l’Opéra or Paris’ 9th arrondissement. The 9th arrondissement, located on the Right Bank, is the perfect place for history and architecture lovers with the Palais Garnier and Boulevard Haussmann, but also for shopping fans since the 9th arrondissement is also home to large department stores such as Galeries Lafayette and Printemps. Along with the 2nd and 8th arrondissements, this arrondissement hosts one of the business centers of Paris, located around the Opéra. Our venue, the elegant 4-star Millennium Hotel Paris Opéra, combines 1920's grandeur with modern amenities, business facilities and impeccable service. The historic hotel is conveniently located near in the Opera District just a stone's throw away from what Paris has to offer best, including the Louvre, Musée d'Orsay, Sacré-Cœur, and the Avenue des Champs Elysées. As we all know, a great venue is the cornerstone of any successful event, and the Millenium Hotel Paris Opéra has just what you need to guarantee the success of your event. You can choose from 6 individual spacious rooms which can be adapted to suit your needs and can accommodate up to 110 people in the Grand Opera room. 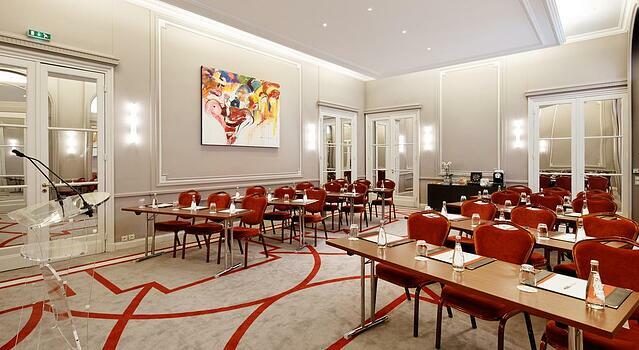 Book your meeting rooms at The Millennium Hotel Paris Opéra with MeetingPackagge.com. Located in the midst of the stylish Saint-Germain des Prés area, Paris’ 7th arrondissement, Pont Royal is home to a long literary tradition. By choosing the heart of Saint-Germain des Prés, you will immerse yourself in literary and artistic Paris. Take a stroll through the small side streets, where the best art galleries are found. At Hotel Pont Royal, life is effervescent, and you can feel the energy. 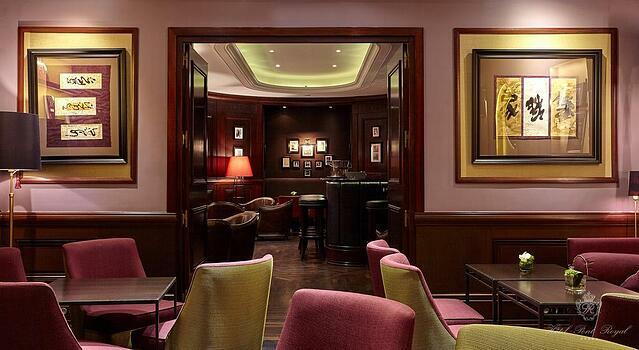 Saint-Germain-des-Prés is a concentrate of talent that makes Hôtel Pont Royal an unforgettable place to stay. Needless to say that this is the intellectual heart of Paris. The café icons named Deux Magots and Flore are a few steps away, and Brasserie Lipp is just around the corner. In need of a calm and confidential space? The Imprimatur room, in the light of day, holds up to 19 people for professional meetings and features all the necessary video and computer equipment. 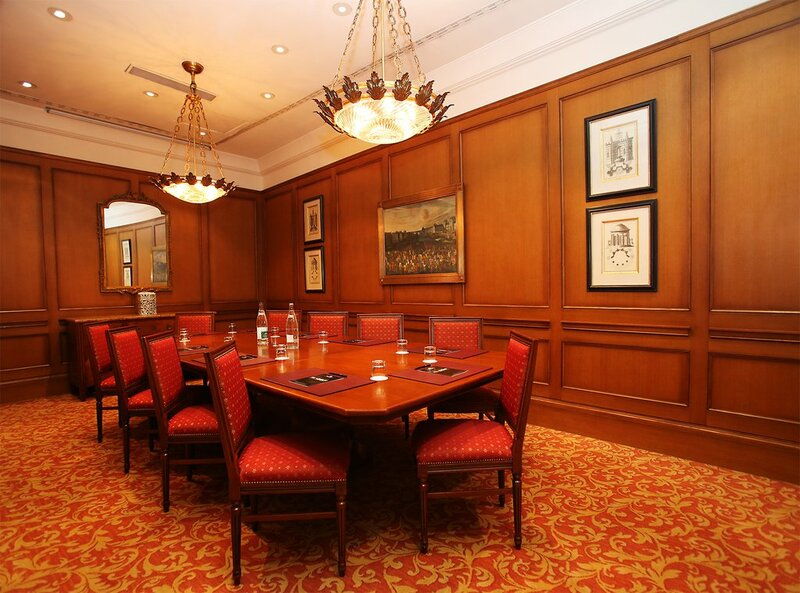 Book your meeting rooms at Hotel Pont Royal with MeetingPackage.com. Our last option for this week will take you to Paris’ 8th arrondissement or better known as Champs-Elysees. Just steps away from the Champs Elysées, Hôtel California has welcomed a demanding clientele wanting to take full advantage of Paris since 1923. Leading stores and French luxury brands are at hand as you stroll along the world's most beautiful avenue. The hotel's classic Art Deco architecture is filled with light and opens to a bucolic central patio offering tranquillity and relaxation. Hôtel California Paris Champs Elysées is the ideal venue for your next international conference or incentive, featuring 174 deluxe rooms and 7 meeting rooms for up to 120 attendees. Known for its personal and attentive service, since 1923 Hotel California Champs-Élysées Paris has aimed to maintain the tradition of the ‘great Parisian hotel’ in a beautiful private residence. This hotel is the ideal place where all your business expectations can be met. Book your meeting rooms at Hôtel Clifornia Paris Champs Elysées with MeetingPackage.com. So what about Paris for your next meeting destination? These above mentioned meeting venues are all excellent choices for your next business event. They offer the latest technology, amenities and as extra, they are located in arrondissements in Paris where you will definitely get the best our of your business event: culture, architecture, bistrots, cafés, shopping, you name it! Paris is the city of Lights and no matter where you are in Paris, after your meeting the perfect way to relax for a little while is to sit back in a small local coffee shop and eat a famous French croissant (So delicious). If you think Paris is the perfect city for your next meeting, MeetingPackage.com has a wide selection of meeting venues in the heart of the city as well as close to the airport.